MOJ Digital Services might have just celebrated its first birthday but who we are and what we do remains a mystery for some. Being fairly new to MOJ myself, many of my meetings start with me explaining my role. When I say I work for Digital Services, people are often aware that we are the crowd wearing jeans and carrying Macs, however not everyone fully understands what it is we actually do. It got me thinking: we are working on a lot of challenging projects at the moment, particularly our four justice ‘exemplar’ projects, so why not tell people about how we are improving public service delivery at MOJ. A few weeks back a number of us were in the atrium at MOJ HQ, luring people into conversation with the promise of chocolate. 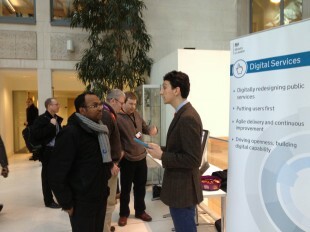 It was a great few hours chatting to staff and visitors about our work and digital more generally. We demoed work-in-progress - including early designs for prison visits booking; and showcased some of our live services - like court finder. There was a lot of positive energy around what we are trying to achieve, and many were excited to hear our plans for the next year. It was also interesting to learn that others were grappling with similar problems, from outdated IT to finding out about new digital tools to help them with their work. If you missed out on chatting to us this time we will be hosting another atrium event soon, so look out! If you can’t wait that long and want to learn more about what we are up to then follow us on Twitter @MOJDigital or email us at contact-us@digital.justice.gov.uk.